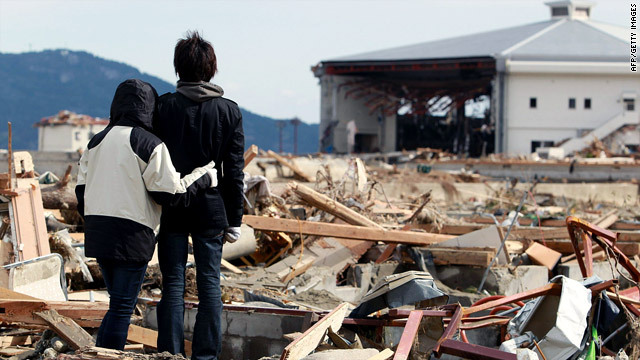 A man and his sister on Thursday stand before their broken house, destroyed by the tsunami at Rikuzentakata, Japan. A magnitude 9.0 earthquake hit northern Japan early Friday, triggering tsunamis that caused widespread devastation and crippled a nuclear power plant. Are you in an affected area? Send an iReport. Read the full report on the quake's aftermath and check out our interactive explainer on Japan's damaged nuclear reactors. [10:43 p.m. ET Thursday, 11:43 a.m. Friday in Tokyo] Japan's National Police Agency reported at 9 a.m. Friday (8 p.m. ET Thursday) that 6,406 people are confirmed dead and 10,259 have been reported missing following last week's 9.0-magnitude earthquake and subsequent tsunami. [9:47 p.m. ET Thursday, 10:47 a.m. Friday in Tokyo] A radiation reading of 20 millisieverts per hour has been recorded at a key annex building at the Fukushima Daiichi nuclear power plant - the highest yet recorded there - an official from the Tokyo Electric Power Company said Friday morning. In comparison, a typical chest X-ray exposes a person to about .02 millisieverts of radiation. A typical dose of background radiation in developed countries is about 3 millisieverts over an entire year. [8:30 p.m. ET Thursday, 9:30 a.m. Friday in Tokyo] The U.S. State Department said it is possible there are still Americans inside the 80-kilometer (50-mile) evacuation zone around the troubled nuclear plants, and is sending a fleet of 14 buses to Sendai - north of the evacuation zone - to evacuate as many as 600 Americans who may still be in one of the areas hardest hit by the disaster and having difficulty traveling because of road damage. [5:28 p.m. ET Thursday, 6:28 a.m. Friday in Tokyo] Engineers have laid a new cable to restore power to the Fukushima Daiichi nuclear power plant's damaged unit No. 2, the International Atomic Energy Agency reported, citing Japanese authorities. They planned to reconnect power to No. 2 once the spraying of water on the No. 3 reactor building was complete. Japanese military helicopters - until shortly after midnight Thursday - dumped water on the No. 3 reactor housing, including its spent fuel pool, at the Fukushima Daiichi plant, the Tokyo Electric Power Company reported. The company said early Friday that efforts to cool the No. 3 reactor have been "somewhat effective." No. 3 is a concern because it is the only one of the plant's damaged units whose fuel rods contain a percentage of plutonium along with uranium. The reactor cores of units 1, 2 and 3 have suffered some damage, but the situation for those units appears to be stable, a top aide to the International Atomic Energy Agency's director-general said. Unit 4, however, remains a major concern because spent fuel rods there are said to have been exposed, resulting in high levels of radiation, the top U.S. nuclear regulator told a congressional committee earlier this week. [4:58 p.m. ET Thursday, 5:58 a.m. Friday in Tokyo] Samaritan's Purse is scheduled to airlift more than 90 tons of emergency supplies to Japan on Friday. Supplies including plastic sheeting for shelters, blankets, and hygiene supplies, will be loaded onto a cargo jet at North Carolina's Charlotte/Douglas International Airport on Friday morning. The 747 is set to depart for the earthquake-ravaged country just after noon. [3:47 p.m. ET Thursday, 4:47 a.m. Friday in Tokyo] More from U.S. President Barack Obama's statement outside the White House: He said that the United States is doing all it can to help Japan, and that the U.S. government has flown "hundreds of missions" and distributed thousands of pounds of food and water. We are "sharing expertise, equipment and technology," Obama said, adding: "The Japanese people are not alone in this time of great trial." Obama also said that the United States has a "responsibility to learn" from the nuclear disaster in Japan. As a result, the federal government is undertaking a comprehensive review of the situation there, he said. [3:43 p.m. ET Thursday, 4:43 a.m. Friday in Tokyo] U.S. President Barack Obama, speaking outside the White House, says that "we do not expect harmful levels of radiation to reach the United States" or U.S. territories in the Pacific. Japan, in contrast to the U.S.'s 50-mile recommendation, has advised people living within a 20-kilometer (12-mile) radius of the plant to evacuate. It also has said that people living 20 to 30 kilometers from the site should remain inside. Japanese authorities also have banned flights over the area. [3:40 p.m. ET Thursday, 4:40 a.m. Friday in Tokyo] U.S. President Barack Obama has said that "we are bringing all available resources to bear" to monitor the situation and help Americans in Japan. [3:36 p.m. ET Thursday, 4:36 a.m. Friday in Tokyo] Efforts to cool down one of the reactors at a quake-damaged Japanese nuclear power plant have been "somewhat effective" since authorities turned helicopters, fire trucks and police water cannons on the facility, its owner said early Friday. Japanese military helicopters - until shortly after midnight Thursday - dumped water on the No. 3 reactor housing, including its spent fuel pool, at the Fukushima Daiichi plant, the Tokyo Electric Power Company reported. Earlier, fire and police trucks were turned on the No. 3 reactor housing for more than an hour, TEPCO reported, and the subsequent steam and lowered radioactivity levels indicated success. [2:20 p.m. ET Thursday, 3:20 a.m. Friday in Tokyo] U.S. President Barack Obama's motorcade has made an unscheduled stop at the Japanese Embassy in Washington. [1:23 p.m. ET Thursday, 2:23 a.m. Friday in Tokyo] Gregory Jaczko, the head of the Nuclear Regulatory Commission, says there is little concern of harmful radiation levels in the United States as a result of Japan's damaged Fukushima Daiichi nuclear power plant. The federal government's recommendation that U.S. citizens stay at least 50 miles away from the plant in Japan remains "prudent and precautionary," he told reporters at the White House. [11:35 a.m. ET Thursday, 12:35 a.m. Friday in Tokyo] The Pentagon says it is offering voluntary evacuation flights to all U.S. military family members on Japan's main island of Honshu. Pentagon spokesman Col. Dave Lapan said the potential number of evacuees could be in the thousands. Military family members will be flown to the United States on commercial aircraft, commercial charters or military aircraft as necessary, Lapan said. [11:14 a.m. ET Thursday, 12:14 a.m. Friday in Tokyo] Stars and Stripes reports that the U.S. military on Thursday began voluntary evacuations for families and dependents on four bases in Japan: Atsugi Naval Air Facility, Yokosuka Naval Base and the Army's Camp Zama, all near Tokyo, the Misawa Air Base in northern Japan. Non-essential workers will also be allowed to leave. [11:03 a.m. ET Thursday, 12:03 a.m. Friday in Tokyo] Temple University announced Thursday it will evacuate the remaining 200 U.S. students from its campus in Tokyo over nuclear concerns. University President Ann Weaver Hart said the school is arranging a charter flight to bring the students back to the U.S. via Hong Kong. Most non-American students and staff will remain, Hart said in a statement on the school's website. [10:47 a.m. ET Thursday, 11:47 p.m. Thursday in Tokyo] Actress Sandra Bullock sent a $1 million donation to the Amerian Red Cross this week to help with earthquake and tsunami relief efforts in Japan, the organization said Thursday. It is the largest celebrity donation to the Red Cross to be announced since the disaster struck last Friday, although the charity may have gotten large contributions that were kept confidential at the donors' request. Click here to see how you can help. [10:17 a.m. ET Thursday, 11:17 p.m. Thursday in Tokyo] Iwaki Kyoritsu Hospital, only 45 kilometers (28 miles) from the damaged Fukushima Daiichi nuclear plant, says it has only a five-day supply of food and a three-day supply of drugs for its 300 patients, the Mainichi Daily News reports. Read the newspaper's report of conditions at the hospital. [9:57 a.m. ET Thursday, 10:57 p.m. Thursday in Tokyo] Japan has lost 25% of its ethylene production since Friday's quake and tsunami, Kyodo News service reports, citing Kyohei Takahashi, chairman of the Japan Petrochemical Industry Association. Ethylene is a key ingredient in making plastics and synthetic fibers, Kyodo reports, both of which are in need for water bottles and medical devices needed in quake recovery efforts. [9:38 a.m. ET Thursday, 10:38 p.m. Thursday in Tokyo] High levels of radiation have been detected 30 kilometers (18.6 miles) from the damaged Fukushima Daiichi nuclear plant, broadcaster NHK reports, citing Japan's Science Ministry. Exposure to those levels of radiation for six hours would be equivalent to the safe level of what a person can absorb in a year, according to the report. [9:19 a.m. ET Thursday, 10:19 p.m. Thursday in Tokyo] Aftershocks of magnitudes 5.6 and 5.9 shook the east coast of Japan's main island of Honshu on Thursday night, according to the U.S. Geological Survey. [9:12 a.m. ET Thursday, 10:12 p.m. Thursday in Tokyo] A worker from the damaged Fukushima Daiichi nuclear plant has been blogging about those workers now battling to prevent a meltdown at the facility, according to The Straits Times in Singapore. On its website, The Straits Times says it has translated the worker's blog. The nuclear plant staff "continue to work even at the peril of their own lives," the worker writes. [8:49 a.m. ET Thursday, 9:49 p.m. Thursday in Tokyo] Singapore on Thursday joined the list of nations advising its citizens to leave areas near the damaged Fukushima Daiichi nuclear plant, Kyodo News service reported. Singapore's Foreign Ministry advised its citizens to evacuate areas within 100 kilometers (62 miles) of the nuclear plant. The United States, Australia and South Korea have advised citizens to move from areas within 80 kilometers (50 miles) of the plant. [8:34 a.m. ET Thursday, 9:34 p.m. Thursday in Tokyo] Chinese authorities were trying Thursday to stop what the Xinhua news agency was calling a "salt panic." "Iodine drugs should be used only under the medical supervision of doctors and medicine specialists," Su is quoted as saying. [8:00 a.m. ET Thursday, 9:00 p.m. Thursday in Tokyo] The Laboratory of Applied Bioacoustics, a unit of Spain's Polytechnic University of Catalonia, recorded the sound of the earthquake that hit Japan on Friday. The sounds had to be accelerated 16 times to make them audible to humans. [7:56 a.m. ET Thursday, 8:56p.m. Thursday in Tokyo] Efforts to cool the No. 3 reactor at the earthquake-damaged Fukushima Daiichi nuclear power plant by dumping water from helicopters and spraying it from the ground will continue, the plant's owner said Thursday evening. [7:37 a.m. ET Thursday, 8:37 p.m. Thursday in Tokyo] An operation to spray water on the No. 3 nuclear reactor at the Fukushima Daiichi nuclear plant has ended after 40 minutes, Japan's Defense Ministry says. Five fire trucks took turns spraying water for two minutes each, officials said. [7:30 a.m. ET Thursday, 8:30 p.m. Thursday in Tokyo] Tokyo Electric Power Company and its affiliates say they will stop building a nuclear power plant and related facilities in Oma, Aomori prefecture, according to a Kyodo News report. Construction began January for the plant on Japan's northeastern Pacific coast with plans for completion in 2017. [6:33 a.m. ET Thursday, 7:33 p.m. Thursday in Tokyo] At least 20 people have fallen ill due to possible radiation contamination - in addition to 19 injured and two missing at the damaged Fukushima Daiichi plant, the International Atomic Energy Agency reported. [6:28 a.m. ET Thursday, 7:28 p.m. Thursday in Tokyo] Japan's National Police Agency reported at 6 p.m. Thursday (5 a.m. ET) that 5,457 people are confirmed dead; 9,508 have been reported missing; and 2,409 were injured following last week's 9.0-magnitude earthquake and subsequent tsunami. [5:53 a.m. ET Thursday, 6:53 p.m. Thursday in Tokyo] France is prepared to help Japanese citizens in the aftermath of last week's earthquake and tsunami, the Interior ministry said Thursday. "France is ready to welcome those Japanese nationals who need care and who cannot be treated in Japan," said Claude Guéant, French minister of interior, who spoke on French radio, Europe 1. [4:56 a.m. ET Thursday, 5:56 p.m. Thursday in Tokyo] The death and missing toll from last week's 9.0-magnitude earthquake and subsequent tsunami continues to increase. Japan's National Police Agency reported at 4 p.m. Thursday (3 a.m. ET) that 5,429 people are confirmed dead, up 108 from the previous count; 9,594 have been reported missing, a jump of 215 people; and 2,404 were injured, an increase in 21 people. [4:30 a.m. ET Thursday, 5:30 p.m. Thursday in Tokyo] Stocks in Japan finished lower Thursday amid fears of a nuclear crisis following the nation's catastrophic natural disaster. The index recovered nearly 6% on Wednesday after plunging a combined 16% during the first two trading days following last week's massive earthquake and tsunami. Overall, in the past five sessions, the index is down more than 14%. Helicopters made four passes in about a 20-minute span Thursday morning, dropping 7.5 tons of seawater each time on the facility's No. 3 reactor in order to cool its overheated fuel pool. But hours later, the Tokyo Electric Power Company - which runs the plant - told Japan's Kyodo News that the operation didn't appear to lower radiation levels. The report suggested levels actually rose to about 3,000 microsievert per hour. It takes a year for a person to be naturally exposed to that level of radiation. An unmanned, high-altitude aircraft is helping the Japanese government assess the damage to towns and facilities from last week's quake and tsunami, the United States Air Force said Thursday. The evacuations include the American Embassy in Tokyo, the U.S. Consulate in Nagoya and the State Department's Foreign Service Institute in Yokohama. [2:56 a.m. ET Thursday, 3:56 p.m. Thursday in Tokyo] Winds have been blowing from the northwest - in some cases at upwards of 30 kilometers per hour - largely pushing radiation from the Fukushima Daiichi nuclear power plant out to sea, according to meteorologists. Still, CNN meteorologist Ivan Cabrera noted Thursday that strong winds may make it challenging to conduct helicopter drops of water on the plant's affected reactors, especially as much of the water may evaporate or blow as it falls. The gusts also enhance frigid wind chills in Japan, where temperatures had dropped below freezing in many locales overnight. Large parts of the Asian nation - including the cities of Sendai and Fukushima - could see snow soon. [2:32 a.m. ET Thursday, 3:32 p.m. Thursday in Tokyo] Tests in Fukushima city, located 80 kilometers (50 miles) away from the damaged nuclear plant, found radiation measuring 12.5 microsieverts per hour - well above the average reading of 0.04, but still well below that considered harmful to humans. Small, harmless amounts of iodine and bequerel - both potential bi-products of a nuclear meltdown - were found in the city's water Thursday. A count two hours earlier had the number of missing at 8,606. The number of dead remained the same - 5,718 - as did the number of wounded: 2,285, the National Police Agency said. [1 a.m. ET Thursday, 2 p.m. Thursday in Tokyo] ﻿﻿President Barack Obama told Japanese Prime Minister Naoto Kan early Thursday that the U.S. will do what it takes to help Japan as it rebuilds following a devastating earthquake and tsunami, the White House said. A Tokyo Electric Power company official said Thursday that - based on information gathered from a helicopter that flew over the Fukushima Daiichi nuclear power plant on Wednesday - authorities believe that there is water in a key fuel pool outside one of the plant's most troubled reactors. Hours earlier, Gregory Jaczko, the head of the U.S. Nuclear Regulatory Commission, told Congress that spent fuel rods in Unit 4 of the plant had been exposed, resulting in the emission of "extremely high" levels of radiation. Japanese Defense Minister Toshimi Kitazawa said that he, in conjunction with the prime minister, decided early Thursday to go through with the operation to drop water over the plant's No. 3 nuclear reactor and spray water from the ground using water-cannons. The plan to drop water from above had been aborted Wednesday, due to concerns about high radiation levels. It went through on Thursday, an airborne effort to cool down the reactor. While most are fleeing the Fukushima nuclear power plant, 180 workers are staying put - despite the fact that doing so could result in serious illness or even death - to battle the meltdown threat. I cherished as much as you'll receive performed right here. The caricature is tasteful, your authored subject matter stylish. nonetheless, you command get got an edginess over that you wish be delivering the following. sick undoubtedly come further in the past again since precisely the same nearly very incessantly inside of case you defend this increase. Well I definitely liked reading it. This subject offered by you is very helpful for correct planning.